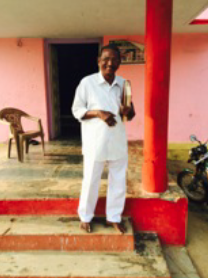 Sunday in rural India | Walk with us! Yesterday Fr. Jojoppa, scj, invited me to accompany him and three theologians to celebrate the 9:30 am. Mass in our parish of the Sacred Heart. We would first pick up four Dominican Sisters who help with the music. Their convent is located in Eluru not too far from the bishop’s residence, which was pointed out to me as we drove to the convent. Br. Bernarji played the key board and led the singing this morning. He also had a group of girls perform two dances for me after Mass. He taught them these dances as past of a Christmas celebration. I am not a dancer but appreciated it and thought the girls did an excellent job. They certainly knew their routines and kept in time together. All of us were out and on the road at the appointed time of 6:45 a.m.. About five minutes down the road Fr. Jojoppa asked if Harish had remembered to bring the flowers for our blessing of the two statues. Oops! We turned back and the cook was waiting at the front gate with flowers in hand, and after a quick turn around we headed back to Eluru to pick up the sisters. Our parish (Sacred Heart) is normally about a half hour drive from the theologate. Our detour to Eluru did add a few minutes to the drive. In addition to the main church it has three sub-stations. The stations average around 40 families each while the parish church has about 190 families. Shades of the American South before segregation were evident –– there are two substations in the same village as they are two different caste. As is common in mission areas, in addition to the pastor the church employs catechists as assistants. Mr. Somaiah was preparing to hold Sunday’s worship service in Saints Peter & Paul sub-station when we drove up. After making the rounds of the three sub-stations to give me the big picture we arrived at Sacred Heart. The Sunday routine begins with rosary at 8:30 a.m. followed by a half hour of Eucharistic Adoration at 9:00 a.m. then followed by Mass. The times are a bit elastic as Mass itself began closer to 9:50 a.m. The parishioners don’t all arrive at the same time. It took until about the time of the homily for the church to fill up. As I’ve previously noted men and women sit on separate sides of the church and with few exceptions (mainly for age) sit on the floor. Following communion and before the final prayer I was asked to bless the statues of the Blessed Mother and St. Joseph. They are not new statues, but were recently refurbished. Using the ritual for the blessing of sacred objects with Fr. Jojoppa’s assistance I blessed them both and then placed the traditional garland of flowers over each statue. We finished Mass sometime after 11:00 a.m. and it was then that I was treated to the dance performance by Benarji’s dance troop. On our way home Fr. 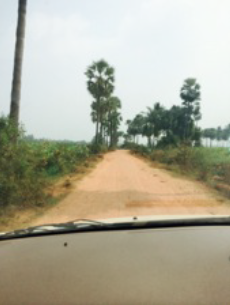 Jojoppa drove pass the piece of land he hopes to buy for a parish house. Bishop Jaya Rao Polimera wants the SCJs to live close to the people. This plot of land will put them somewhere in the middle of the parish and not too far from the main road. According to Fr. 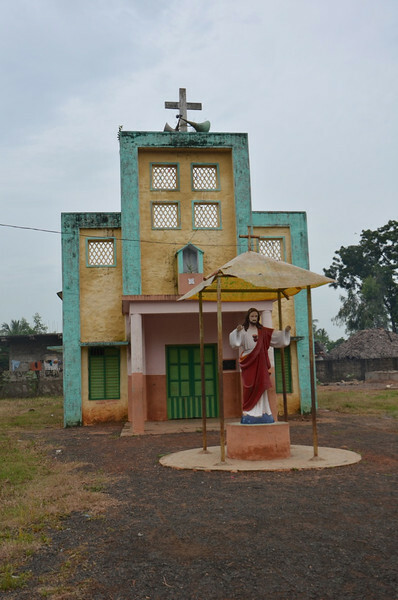 Jojoppa, because Eluru is a poor mission diocese the bishop does not pay religious as they are expected to fend for themselves. When I asked: Is this common in India? Yes, was the answer I received. This photo also shows the type of roads found all around Sacred Heart parish once you get off the main highway. In the villages, at least the main street is often paved. Travel during the rainy season can get a bit dicey when these roads turn to mud but Fr. Jojoppa assured me that rarely did he need to use the 4 wheel drive jeep. He usually travels around the parish by motorbike.